We at Progressive House Worldwide [PHW] are thrilled to unleash our first, but definitely not last compilation were we bring together some of the names that gives us great pleasure through their music. We are so happy to have all these great and skillful producers among us and really hope you want to join us for this superb setting. We believe there will be one or two tunes to wrote home about! Opening this journey is maybe one of the hottest names out there at the moment. Winning remix competitions on both Silk and Armada in just a couple of months time, that for sure has been a boost for the very talented producer hailing form the UK, Toby Hedges. With his blistering act, called "Mirai", you will have the perfect wake up call for what is to come on this massive release on PHW. With his razor sharp sound design, crisp percussion and his mighty talent to write melodic hooks, you definitely have a progressive stormer that is just made to perfection. We believe you will hear loads more from this guy, all over the world in the coming years and we are nothing less than thrilled to bring him in for you here! Second up is another melodic gem, this one coming from the hardworking duo based in Canada , Blue Harvest. Brandon and Alexandre has built a sweet laid back melodic track here, as always with a great thought behind it. Be ready for some stunning melodic work and a more mellow side of progressive house here. Moving forward, we now are back in the UK. Here we are pleased to bring back one of the guys that were having a remix for us on PHW009, the one from Mike Hennessy called "Alice". Deepen Ravalia aka D05 is one of the guys, making some innovate and experimental progressive house with loads of melodic twists and turns in his productions. This time he brings you his trademark bass line that is bringing a lot of retro feel in to the track. We are as excited as ever to have him back with this production called "Mine" and we could never ask for more than that we hope to see him back with more of quality stuff on the label not too far from now. 4th out on PHW and Friends is another UK based production, this one a bit further up north in the country. The Newcastle act baptized as Idleminds is once again with us and as always they have made us a superb production called "Tirari". With blistering melodies, smart percussion and driving chords, they know exactly that have brought in another stormer in the house of PHW. This is the style of music that we would never turn down. Thanks for being around us guys. With us moving ahead in Europe, the next stop is in Poland. With a unique touch for bringing melodies on the table, former Colorize [Enhanced] producer Martin Graff turned in with this one in the last minute, and boy we are happy for that! With pounding kicks, driving stabs and a great mixture between laidback melodies and driving main room chords, you will have a fantastic production here to dig in to. As always Martin Graff is a great addition and we are as excited as always to see were the journey will end for him, we for sure know that it all just have started and we can't wait to see him back. The next stop is made in Denmark, with the very talented producer Jocey contributing with a phenomenal melodic progressive production. This is a very feel good vibes progressive production, including some great work with the melodies. Pure awesomeness is coming up here to be honest. Jocey has been around and will be a future producer on the label. Thanks for everything you have done for us in the past, you know what I am talking about and I can't thank you enough. Following in the same footsteps is a rare talent that we are really happy to showcase to you. UK based Andy Forbes is among some of the artists on our PHW and Friends that we haven't seen too much of in the past, and PHW and Friends is a way to showcase more upcoming talents, in a great mixture with some of the more known producers. We though won't compromise on quality and we SO feel this track is one of those rare productions, filled with happy melodies and great driving elements. We feel we have a little surprise for you here and we are truly happy to have landed this one for you! Next on our journey, we turned our attention to a production from a long time friend of our website, and we felt we go a special one right from the start. With his base in California, US, Jay Flora has made a superb melodic progressive production that we never ever thought of leaving out. With big melodies combined with great structure, swelling pads and massive stabs, this for sure is something to write home about. It's just really uplifting and will leave you with a smile on your face, which we are sure of. We are moving ahead on the journey and moving to island of Iceland, were a brand new act baptized to Freydal definitely made us speechless to say the least. With his gorgeous production "Standstill" we are thrilled to hear what you have to say about this one. Expect superb bouncing kicks, driving stabs and phenomenal melodies that just made us go nuts when we heard it a couple of months ago, a super track is here for you! Next up is a track that I have been chasing for well over a year, and I am thrilled to finally getting the Russian producer IN5UM out of the army. With superb textures and a rich atmosphere, he brings us nothing less than a knockout production here, with the progressive trance production named as "Lost World". With rich melodies, lush harmony and a massive width to the track, this is just a gorgeous production that we were able to bring you all. We are really really happy to include such a sine and skillful piece on the PHW label. Our next stop on this journey was made in Skopje, Macedonia. Here we found a blistering progressive trance track that we said yes to right from the start. With a superb creation, Nenad Kaevik aka Digital Affliction hopefully has made a name for himself with this beauty. We for sure will do what we can to bring him in again. With throbbing kicks, massive bass lines and big driving melodies we are very pleased to bring such a production in on the label, for us a blistering production, worthy all publicity it can get. Keep an eye out for this guy, he will rock in the future also! The journey on PHW and Friends continues, now with a stop in Hungary, at the very well-known Several Spirits studio. With his superb take called "Speeding Yacht", he once again showcase that he is here to stay. Big melodies, deep kicks, massive synth rolls and some phenomenal work with a couple of vocal chops makes this a true stand out production, you will have an ace here to bring to life. We love the sound coming from this guy. The great sound of US duo Infinity State is once again with us and as always they showcase their creativity with a pure bliss coming up here. With their raw talent to create driving melodies, bouncing stabs, driving bass chords and everything in between to build those progressive monsters, we would define this as nothing less than outstanding. Pil and Dan made it again! As the 14th track on the compilation, we make the return journey to Hungary, to bring a new member to our roaster. Moon.Bay is a brand new act on the scene, but after this we hope to give this guy some credit and a wakeup call to all of you that he is here to stay. With the production named as "Bloodstream", we are to bring in a deeper touch on the release also, still with all the necessary elements to build a progressive beast. With warm and emotional bass sounds and "feel good" melodies you will have a stunning piece of music here, not be overlooked, promise yourself that, it's just stunning stuff coming here. As we are getting closer to the end now, we are to bring in a really nice production from one of our close mates on the label, Alexander Chilari. The young producer hailing from Moldova comes with a big melodic track, baptized as "With Love". The tile says it all about what we are trying to bring you here. 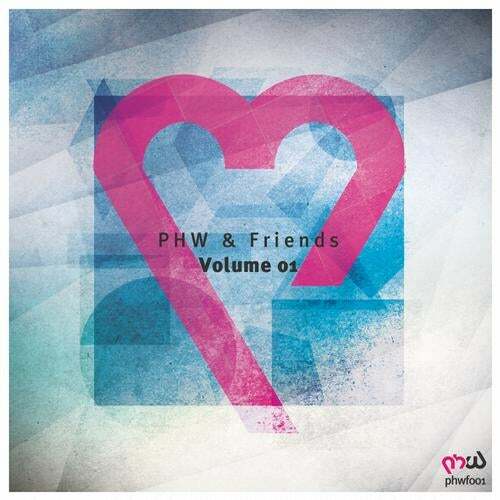 Big kick drums and emotional melodies made it an easy choice for us to contribute on this PHW and Friends. With a stop in Italy, together with David di Sabato, we are about to finalize the journey we wanted to give you with this great compilation. Bringing the tempo down a few notches, we feel you will have a warm and emotional production to cool down with. With fluid vocal chops, together in a blend mix with emotional sound design, this is something that will make your heart go warm and we can't thank Mr. di Sabato enough for bringing this to the PHW desk, superb work my friend. Getting down to the final production this time, we are pleased to have two of our closest friends to the label in, to round the release of for this time. With their first ever collaboration, the great combination of Denmarks finest Jocey and US bound Taylor Raburn brings you a unique chill out closing production that will make a memory to all of you. "The Promenade" is a great closing act for what is to be something we are very proud of, the first of many PHW and Friends compilations. With stunning structure, fantastic pads and a remarkable atmosphere we are to say good bye for this time and we hope you have enjoyed it as much as we have. Thanks to all of you for being a part of this amazing adventure it has been to get this compilation together and all the kind words we have had about it so far. We hope to see all of you back on PHW in the coming years!